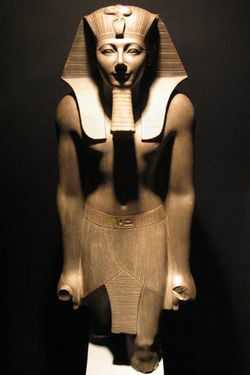 Thutmose III was the sixth pharaoh of the 18th dynasty of Egypt. He was co-regent with his step mother Hatshepsut (considered the 5th Pharaoh of the 18th dynasty) for the first 22 years of his reign. He was the son of Thutmose II, the 4th pharaoh of the New Kingdom. Thutmose III was not old enough to rule when Thutmose II died and so Hatshepsut, his principal wife (queen), had a co-regency with Thutmose III which lasted until her death. Thutmose III is considered to be one of the Greatest Pharaohs of Egypt expanding the the Egyptian Empire further than any other Pharaoh. He conducted 17 campaigns, conquering as far north as Niya in Syria and as far south as the 4th cataract of the Nile in Nubia. Thutmose III attacked Caanan in his 23rd year (The Seige of Megiddo) shortly after Hatshepsut's death. He plundered Jerusalem in the 5th year of King Rehoboam and took many of the treasures in Solomon's temple back to Egypt. Thutmose III was the Pharaoh named Shishak recorded in the Bible. The seige of Megiddo lasted 7-8 months, after which Thutmose III gained control of Northern Caanan. 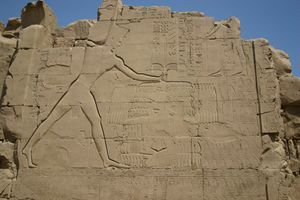 Thutmose III recorded his victories at Karnak. The Syrian princes were obliged to pay tribute and their sons were taken as hostages to Egypt. His mummy was discovered in the Deir el-Bahri cache above the mortuary temple of Hatshepsut. The mummies of Ahmose I, Amenhotep I, Thutmose I, Thutmose II, Rameses I, Seti I, Rameses II, Rameses IX were also found in the cache as well as some mummies of the 21st dynasty. Thutmose III ruled for a period of 54 years, the first 22 years being co-regent with Hatshepsut (the queen of Sheeba who visited Solomon). 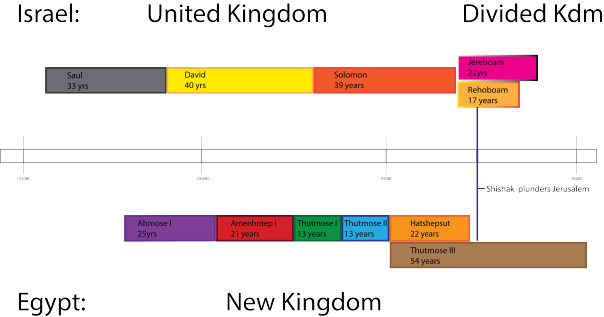 The revised dates of his reign: 950BC to 896BC approximately. His first born son Amenemhat predeceased Thutmose III. He had a 2 year co-regency with his son Amenhotep II at the end of his reign. Amenhotep II (the 7th pharaoh of the 18th dynasty) was the son of a minor wife also called Hatshepsut. Thutmose III was buried in the valley of the Kings when he died. This page was last modified on 23 July 2016, at 09:02.